Experience the essence of "African Oceans". From stylishly appointed rooms, awaken to an uninterrupted view of the azure ocean, the misty Outeniqua mountains and the the sound of waves rolling over sandy-coloured beaches. Luxurious rooms with mini bar, satellite TV, CD/DVD player, air-conditioners and private balconies/patios set the scene for a memorable stay. Direct access to the beach. The exceptional treatment, unique and thoughtful touches, attention to detail, the luxury and the opulent comfort all add to the exciting possibility of returning again and again. Breakfast is served in the sun-splashed dining room. Option of self catering. Relax at the pool, soak up the sun, swim in the sea or stroll along the golden beach. Perfect honeymoon and golf destination. Gondwana is a private game reserve in South Africa that holds the distinction of being the only fynbos reserve in the world that's home to free roaming Big Five game as well as endangered species like the Cape mountain zebra and black harrier among many others. 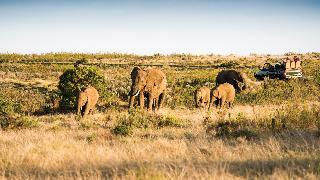 Set on 11,000-hectares, its breathtaking beauty will soothe and delight you with its endless mountain views and green rolling hills blanketed in colourful fynbos.Gondwana shares the route's idyllic climate, second most moderate in the world and is Malaria-free, offering prime year round game viewing. Gondwana's luxury private bush villas are the ultimate alternative to a Five Star hotel offering complete privacy and awe inspiring views. For a stress-melting getaway in one of the most beautiful settings in the country, visit and immerse yourself in the wild beauty of the natural surroundings. 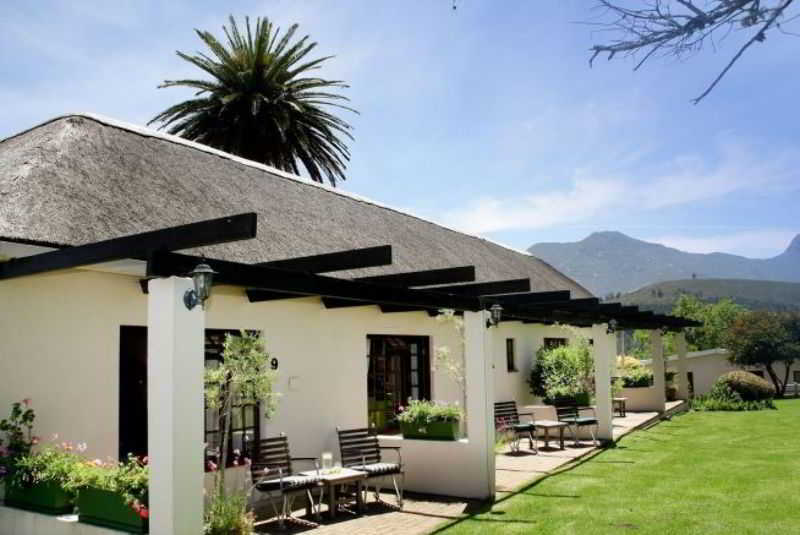 Built in a typical English-style mountain resort, this charming inn is set on a 400-acre estate amidst magnificent mountain scenery at the foot of the Robinson Pass in the Ruiterbos Valley Region of the Garden Route, between Mossel Bay (35km) and Oudtshoorn (50km) in the Western Cape. Guests can choose from a range of delightfully furnished accommodation, including family units, thatched rondavels and timber log cabins situated in different parts of the lush gardens shared by an abundance of birdlife. Established more than 80 years ago the Inn is renowned for its friendly hospitality, superb service and a range of recreational facilities amidst magnificent mountain scenery. The Inn's proximity to the green coastal belt of the Garden Route and the timeless Little Karoo allows for easy exploration of the diverse attractions that these two regions offer. 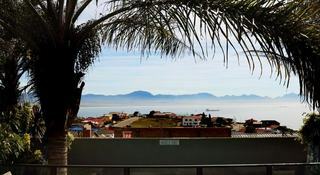 This property is located in Mossel bay . Hotel was built in 2001. Hotel underwent renovation in 2013. The property consists of 43 rooms. The property consists of 18 double rooms, 2 suites and 23 family rooms. The Hotel enjoys an idyllic location in the heart of the city. The main train and bus stations are just a short drive away. There are multiple public transport links within easy reach. Guests will find the airport within easy reach. Golf lovers will be pleased to find the nearest golf course closeby. The beach is set in the immediate vicinity of the Hotel. The Hotel is located a few steps from the harbour. The establishment is wheelchair-accessible. Guests may take advantage of the on-site car park. 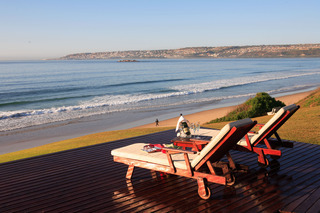 Situated in D' Almeida in Mosselbay, Hotel Portao Diaz offers an authentic African-urban experience in a local setting. 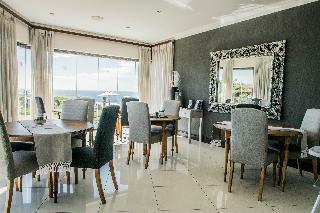 It also features panoramic views of the bay and the Outeniqua Mountains. Enjoy a genuine cultural experience, surrounded by the modern comforts of a luxurious hotel. The nearest beach is 3.4 km away.The rooms include an en-suite bathrooms, tea- and coffee-making facilities, and a hairdryer on request. Some of the rooms have self-catering facilities as well.Featuring South African cuisine, the hotel's restaurant offers seating for 100 guests, and an a-la-carte menu is available throughout the day. The cosy lounge bar features a big-screen TV. For breakfast, a traditional South African buffet is offered, cooked on an open fire outside.Guests can take a dip in the heated outdoor pool, play a round of billiard or experience life amongst ordinary South Africans. Situated on a 3000ha game reserve located between Mossel Bay and George, Botlierskop offers an immense diversity of wildlife and activities coupled with luxurious, tented accommodation discreetly positioned along the riverbank. 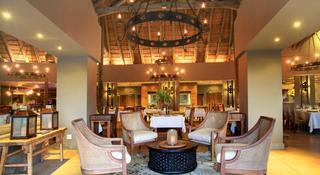 The reserve comprises of over 26 different species of animals and more than 200 bird species. Each of tents are elegantly adorned in a romantic colonial theme with 4-poster beds draped in mosquito nets. The en-suite facilities are lavishly equipped with deep oval baths and open-air showers. Relax at the pool with its' breathtaking views of the valley below or seek out either of our two fireplaces for a cozy evening at the Fireplace Restaurat. The Spa situated on the riverbank surrounded by magnificent mountain scenery while other activities includes guided game drives, elephant back rides, -feedings; horseback safaris, walking with African lions. Only 3-and-a-half scenic hours' drive from Cape Town, this malaria-free, private game reserve is home to an abundance of animal and bird life including the big five. Set against the backdrop of the majestic Langeberg mountain range, the lodge guards the entrance to South Africa's world famous Garden Route Coast. It is 97 km from George Airport and Cape Town Airport is 355 km away.Renovated in 2010, this family-friendly reserve comprises a total of 34 refurbished spacious lodge rooms, where luxury and comfort are combined with an African theme. Complete with en suite bathrooms, the lodge rooms lead onto a west-facing balcony which offers breathtaking African sunsets, all within steps of the pool. These rooms are ideal for families and are located closer to the lodge amenities. The expansive wooden decks overlooking the valleys below allow guests to relax and unwind to the sounds of the African night. The facilities available at this lodge include a lobby area and 2 restaurants.All rooms come with a private bathroom with a shower and a hairdryer. They are equipped with a TV and tea and coffee making facilities.orning and evening game drives are led by experienced and knowledgeable game rangers who share their knowledge of big game and local African folklore.Guests may dine in one of the hotel's 2 restaurants: the African Boma, which provides a hearty menu of tasty traditional cuisine and chef's specialities, presented on open coals in African pots, and the breathtaking Serengetis, offering a more interactive dining experience.Guests arriving from Cape Town should take the N2 highway out and head east for 348 km. After reaching the small town of Albertinia, the entrance to the lodge is 7 km further on. Those coming from George should take the N2 highway and head west for 85 km. 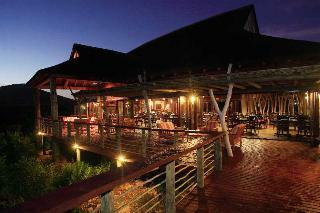 After crossing over the Gouritz River Bridge (Bungy Jumping), the entrance to the lodge is 12 km further on. 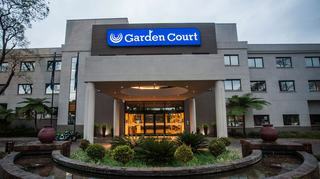 Located in the heart of the Garden Route, this hotel is uniquely positioned on the rocks below Mossel Bay's famous St Blaize Lighthouse.The air-conditioned hotel offers 52 sea-facing rooms, a lobby with 24-hour reception, a hotel safe, currency exchange facilities, a cloakroom and lift access. Further facilities at the hotel include a restaurant which offers stunning views over the sea and rocks, with à la carte menu, as well as set menus and buffets available for functions and special occasions. Furthermore, the hotel offers a bar, conference facilities, WLAN Internet access (for a fee), room and laundry services (both for a fee) and a car park.The en suite rooms, each with a private balcony which guarantees stunning sea views over the Indian Ocean, are spacious and well-appointed with modern light furnishings. The bathrooms are fitted with shower, bath and hairdryer. Each room also has a seating area. Furnishings include a desk, bedside reading lamps, satellite/cable television, individually regulated panel heater, remote controlled ceiling fan, international plug points, radio alarm, safe and coffee and tea making facilities. Built-in wardrobes, luggage storage area, direct dial telephones, double beds and an ironing set, as well as WLAN Internet access, all additionally feature as standard.A huge outdoor tidal pool in front of the hotel offers safe bathing. Guests may also go surfing.Breakfast buffet is served each morning, whilst lunch and dinner are offered à la carte. We loved our 2 night stay at African Oceans. Suite 3 offered us some luxury and relaxation and the staff were very attentive.